First of all, I would like to know what do you think about the new design of the blog, I've made a few changes, here and there. I also introduced a new contact form that would make the communication between us easier. I really hope that you like the new layout, you're feedback would be much appreciated. I think it was about time I did a winterish manicure...but my timing isn't perfect because all the snow we had here, melted these last few days. So hopefully with my manicure, I'll bring back a little bit of winter. 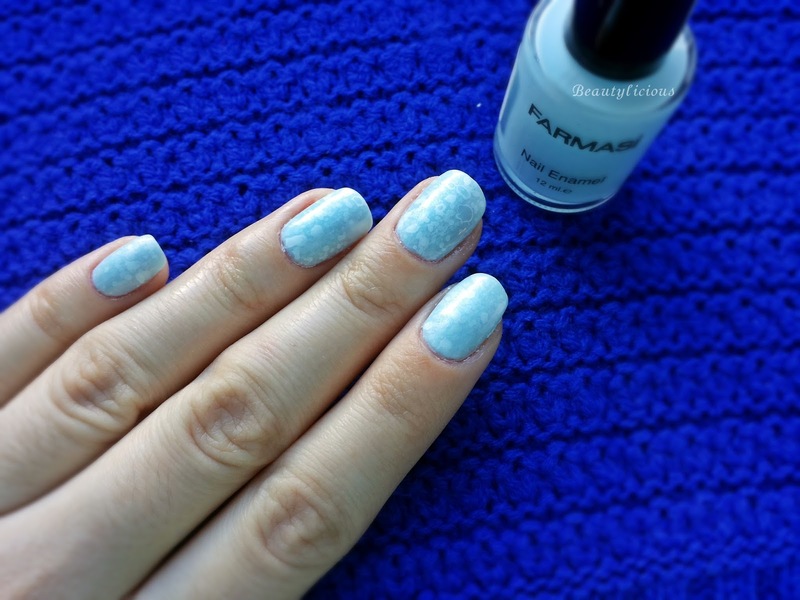 To achieve this look you need a light blue base, I used Farmasi #112. This nail polish is a simple creme, but it's not that opaque, you'll need three coats to reach full coverage. Now, for that effect I've used the splatter technique and white acrylic paint (there is a video tutorial at the end of this post); my mistake was that I diluted the paint too much, so be advised. For more shine I've applied a layer of Avon Platinum top coat. Below, you have a video tutorial of this technique, it's a simple one, you can use nail polish as well. Arata foarte bine aceasta nuanta pe unghiile tale, iar tehnica splatter chiar se potriveste pe ea. foarte interesanta ideea! cu siguranta am sa o incerc si eu!